It's Monday. It's a rainy, gloomy Monday. The sky is gray, the yard is Carolina mud red, and soon, my pups and carpet will sport that lovely orangish-brownish tinge. I had such plans for today. I was going to plant my large kitchen garden, incorporating tulips, daffodils, and Dutch iris bulbs throughout the edibles so that I'd have an endless supply of my favorite spring flowers. Instead, I'm fighting the urge to curl up on the couch with my blanket and take a nap. Honestly, the only thing keeping me from the nap is the chance that Peter might come home for lunch. I think he has a meeting, but I'm not going to chance it. Rather than endure potential ridicule from my hubby (which would be well-deserved), I'm contemplating a clean-up. Truly, our house is bursting with junk. We're starting a remodeling project soon, but first we need to purge. Add into the equation that I'm room mom for both Kristen and Michael's fall parties on Friday, and I'm overwhelmed with plastic pumpkins, construction paper, and bags of candy. Really, what was I thinking? I need a clone. OK. The house is too overwhelming. I don't know about you, but whenever I spend hours de-cluttering, the kids manage to re-clutter it within about 20 seconds. I don't think I have the patience for wasted work today. Instead, I thought I'd share one of the few spots that is (currently) perfectly organized. A potager, for those of you who avoid pretentious gardening terms, is simply an organized kitchen garden. Pronounced “puh ta zhay,” the potager design precedent is from the Gardens of the French Renaissance and Baroque Garden eras. Often flowers, both edible and non-edible, as well as herbs are interplanted with vegetables and fruit to enhance the garden's beauty. (Plus, the flowers attract beneficial insects.) The potager is aesthetically pleasing but also functional. From formal knot gardens to cozy cottage gardens, potagers vary in size, shape, and design. is a perfect example of gardens that make me weep with their perfection. I buy gardening magazines obsessively, determined that our kitchen gardens will be lush, perfect. But it's not always easy to achieve my goals.
? I watched the scene which showed Meryl Streep's impeccable kitchen garden at least a dozen times, taking notes on what the set designers were growing in that gorgeous potager...until I realized that they had tomatoes and cabbage growing at the same time. Later, I read that the tomatoes were actually wired to the vines to ensure the perfect garden specimens. Ah, Hollywood. How you torment me. ...who use the backyard as their personal race track/agility course, and suddenly—there's no vegetation in site. So, last autumn, I persuaded Peter to build a potager in the midst of the mud—but where there's a patch of sun. He loves when I have brainstorms, really, he does. I'm sure of it, no matter how often he rolls his eyes. It challenges him to take my fantastical, seemingly simplistic (to me) ideas and turn them into reality. Honestly, how long could it take to whip together the basis for a kitchen garden? Well. With my Swiss husband, precision isn't good enough. Perfection is the standard. I must admit, I've learned a thing or two from him about planning. First, he drew a design, measured and marked off the shape of the garden. Next, he enclosed the area with easy-to-install fencing that we found at Lowe's. The fence serves an obvious purpose...keeping Sophie and Chloe from racing through the garden. It also provides support for vertical growing. In the spring, peas climbed the fence, while this summer it supported tomato plants and beans. After enclosing the space, he began outlining the beds with stone. We then filled each quadrant with compost and soil. Finally, he installed a stone base for the large container and filled the paths with pebbles. My first step was to decide what my family would eat, because I wanted to involve the kids in growing food and eating from the garden. Unfortunately, our children are vegephobes. I know my parents are enjoying a good chuckle over this while they drink their Bloody Marys in the great beyond, as I was the worst, pickiest eater. My childhood vegetable repertoire consisted of plain Iceberg lettuce (no dressing), corn, and potatoes. My children follow in my footsteps. Sorry. So, to encourage the kids, I planted a border of strawberries in the potager, which was a hit. Obviously, the strawberries are a permanent garden fixture. Various lettuce and spinach plants were added, as well as radishes and a border of violas. The first season was OK. It didn't meet my expectations for a lush, bountiful, beautiful kitchen garden, but we did have an excellent harvest of strawberries and lettuce. This fall, I became a little more thoughtful in my approach. I even made a plan. It's highly professional, don't you think? First, I cleaned up the remaining tomato plants and most of the peppers from the summer garden. I honestly don't have a good photo of the summer potager, because it quickly became overrun with tomatoes and, frankly, was just unattractive. So much for my desire for an organized, aesthetically pleasing garden space. It produced well, though. I also pulled up the basil and froze it for future pesto. For our 2010 fall planting, I started with some transplants—red and green romaine lettuce, bibb lettuce, cauliflower, brussel sprouts, pak choy and chives. Yellow violas provide an edible flower border inside the fence. 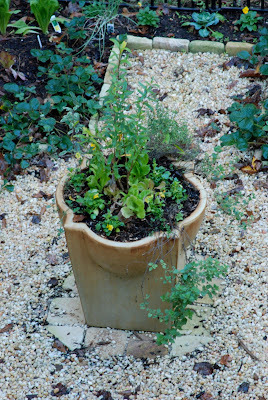 Added to the center container of Greek oregano, persimmon, and lemon thyme were several lettuces and violas. I must admit—I'm pretty happy with the potager so far this fall. I planted a little later than I planned, but the plants are growing well, and the seedlings are looking good. I'm hoping to get out tomorrow and thin the seedlings. What's that? In the back corner. ACK. Those are definitely NOT spinach seedlings. So much for my little bit of organization...the weeds are taking over. Just like the clutter in the house. The rain is gone. I suppose I'd better tackle those weed seedlings so at least something in my life is organized. So much for that nap...it's time to fight weeds. Wish me luck. Please? Are you growing any cool season crops? What and where are you planting? And--have you had the first frost in your zone yet?